Has your primary care provider said you need glasses, but you’re afraid they won’t look good? Do you think contacts might hurt your eyes or be hard to take care of? It’s normal to have lots of questions and feel nervous about getting glasses or contacts. However, it’s important to wear them if your vision needs correcting. Not wearing corrective lenses can cause headaches and other problems. How do I know if I need glasses? If you’re having trouble reading or seeing the blackboard, it’s possible that you need glasses or contacts. If you already have glasses or contacts, your vision may have changed and you need a new prescription. Learning disabilities can also cause reading problems by making it difficult to write, read, or do math. It’s important to see a doctor to understand why you’re having trouble reading. Why do I need glasses or contacts? Many teens have trouble seeing objects up close or far away. This is called a refractive error and is the most common type of eye problem. Refractive errors are caused by the eyes’ shape being abnormal. This means that the eye doesn’t bend light in the right way to create a clear picture. Wearing glasses or contacts is one way to correct your vision and help your eyes see clearly. How do glasses and contacts work? To understand how corrective lenses work; let’s first review how your eyes see. Your eyes have lenses that focus light on the retina, or back of the eye. The retina changes the light into electrical signals that are sent to the brain. The brain uses these signals to create an image of what you see. Many people’s eyes are abnormally shaped. This means that the lens can’t focus light on the retina. Depending on the type of vision problem you have, the light can fall in front of or behind the retina. This creates a blurry image. Glasses and contacts change the direction of light so that it hits the retina and creates a clear picture. Glasses have been around since the ancient Egyptians and they work even better today. Glasses are easy to wear and take care of. Frames are the part of the glasses that hold the lenses. They come in lots of different shapes, sizes, materials, and colors. You’ll be able to decide what shape/style looks best and is most comfortable on your face. However, some frames will fit better than others. Choose frames that don’t touch your eyelashes or cheeks. Make sure your eyes are in the center of the lenses. Adjust the pieces behind the ear and pads near the nose for the best fit. Some frames last longer than others. Spring-loaded frames are less likely to bend or warp. Nose pads prevent the frames from slipping on your nose and provide added comfort. Eyeglass lenses come in different prescriptions, depending on what type of vision problem you have. Lenses correct your vision by refocusing light onto the retina, or back of the eye. After your doctor gives you a prescription for lenses, you still have some choices to make about the type of lenses you’d like. Lenses are made from different materials. Choosing the right lenses depends on what activities you do and how you’re going to use your glasses. Only you can decide what lenses are right for your lifestyle. But your lenses do need a couple of things to last a long time and give you the right amount of protection. Are shatter resistant (made of polycarbonate) – Shatter resistant lenses are designed to protect your eyes from injury and not break if you drop them. Have U.V. (ultraviolet) protection – This protects your eyes from the sun’s harmful rays. You may want your lenses to have other features. Talk to your eye specialist and parent(s) or guardian(s) about what lenses are best for you. Keep in mind that these features usually cost more money. Anti-Reflective Coating cuts down on glare from bright lights. May make it easier to see when you’re driving at night. Scratch Coating reduces number of scratches on your lenses. Tinting – Color added to lens for style or to block out the sun. Lenses can also get darker in outdoor light to act as sunglasses. Thin lenses are lightweight and very thin. They may feel lighter on your face. Even shatter resistant glasses can break, if you’re not careful. Put your glasses back in the case when you’re not wearing them. Be careful not to set your glasses down on the lenses, which may scratch. Keep your lenses clean by wiping them with a clean, dry cloth, or with a special eyeglass cleaning liquid. Only wear sports goggles when playing sports. Wearing normal eyeglasses could cause injury. When should I wear my glasses? Wear your glasses as often as you need them to see. This may be all the time or only sometimes. Bring your glasses with you at all times, so you can be sure to have them if you need them. Bring your glasses to your driving test and wear them if you need them. If your driver’s license says you wear corrective lenses, wear your glasses every time you drive. Wear sports goggles during sports or other physical activities when you need your glasses. Do NOT wear your normal glasses during sports. Glasses can break and seriously injure your eyes. Sports goggles are designed to protect your eyes and can be made with the same prescription as your eyeglasses, but they’re shatterproof and safe. Contact lenses work in much the same way as glasses. They correct your vision by focusing light on the back of the eye, or retina. The difference is that contacts sit on your eyeball, instead of in front of your eyes. For this reason, they can be dangerous if not used properly. Contacts are small, plastic discs that sit on your cornea–the clear surface of the eye. According to the Center for Disease Control (CDC), more than 30 million people in the U.S. wear contacts. Similar to glasses, contacts can correct nearsightedness, farsightedness, and astigmatism. There are different types of contacts, but most people wear soft lenses. These lenses are thin and usually feel comfortable on your eye. Soft contacts can be worn once and thrown out or reused for weeks or months, depending on the type of contact lenses you buy. Single use lenses are worn for only one day and then thrown out. Daily wear lenses are worn during the day and taken out at night. You throw them out after many weeks. They are less expensive but need to be cleaned frequently. Extended wear lenses are worn day and night for a certain number of weeks. They have a higher risk of infection and other eye problems. Contacts are not right for everyone. People with certain eye conditions or who are prone to infections should wear glasses instead of contacts. If your doctor doesn’t think contacts are right for you, he or she will give you a prescription for glasses. Contacts are harder to take care of than glasses. They also take more time to clean and to put in your eyes. If you’re going to wear contacts, you have to be willing to put in the extra time and energy to keep your eyes healthy. Some people have trouble touching their eyes. If you don’t like touching your eyes, it may be hard for you to put your contacts in and take them out. You may have to practice doing this before you feel comfortable wearing contacts or you may find that glasses are a better choice for you. What happens when I get contacts? Your eye specialist may prescribe contacts for you during your eye exam or you may have to come back for another visit to get your prescription. Finding the right contacts for your eyes is called a contact lens fitting. This may take 2-3 hours in order to find a contact lens that fits your eye and feels comfortable. Your eye specialist will show you how to put your contacts in and take them out, and how to take care of them. 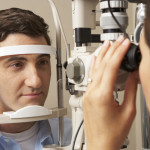 You will practice with the eye specialist until you feel comfortable doing it on your own. The eye specialist may have your contacts in the office or they may have to be ordered. A follow-up appointment is usually scheduled for a week after you start wearing contacts, so the eye specialist can check how your eyes are doing. Wearing contacts may feel strange at first. You may feel like there is something moving on the surface of your eye. It takes 10-15 minutes for contacts to settle into place when you first put them in your eyes. Once they stop moving, you will probably feel nothing. If you wear your contacts for too long or your eyes are dry, the contacts may feel uncomfortable. Use wetting drops to moisten the surface of the contact lenses. Don’t use other kinds of eye drops as they can damage your contacts. Take the contacts out of your eyes and give your eyes a break. Some lenses are larger, such as the ones that correct for astigmatism. It may take longer to get used to these lenses. How do I put contacts in my eyes? Put in your contacts in the morning, after you shower or take a bath or wash your face. Stand in front of a mirror in a well-lit bathroom. Wash your hands with soap and water and dry them on a clean, lint-free towel. Take one lens (either right or left) out of the case and place it in the palm of your hand. The lens should look like a bowl sitting on its base, not an upside down bowl. Add several drops of fresh contact solution to the lens. Rub the lens gently with your finger up and down and then back and forth for 30 seconds. Do not rub the lens in a circle. This can damage the lens. Place the lens on the tip of your index finger. Use the middle finger of the opposite hand to gently pull back the upper eyelid of the eye you’re going to put the lens in. With the hand holding the lens, use the middle finger to gently pull down the lower lid. Look straight ahead as you gently place the lens on the colored part of your eye (iris) with your index finger. Make sure the lens follows the shape of your eyeball. Rinse the lens case out with fresh solution. Place it upside down to dry. If the lens feels uncomfortable for more than a few minutes, it may be inside out. Follow the steps for taking out your contacts. Gently flip the lens right side out and put the lens back in. How do I take contacts out of my eyes? Take out your contacts at night before going to bed. Do this before you wash your face or take a shower. Don’t leave your contact in overnight or if you take a nap. This may cause eye infections. Stand in front of a mirror in a well-lit bathroom or use a stand mirror. Fill the lens case with fresh contact solution. Always remove the same contact lens first; generally this is the right contact lens. Look up and pull down the lower lid with the middle finger of your removal hand. With your thumb and index finger, gently squeeze the lower edge of the contact and pull it away from the eye. Place the contact in the palm of your hand. The lens should look like a bowl sitting on its base, not an upside down bowl. Rub the lens gently with your figure up and down and then back and forth for 30 seconds. Do not rub the lens in a circle. This can damage the lens. Place the lens in the right compartment of the lens case. Make sure it is covered by fresh solution. Replace the cap and screw tightly into place. Repeat with the other lens. Be very careful when removing your contacts. Pressing too hard or scratching the eyes with your nails may cause serious injury. How long can I wear my contacts? Only wear your contacts during the day. Take out your contacts at night before you go to bed or before you take a nap. Ask your eye specialist how long you can use your contacts before changing to a new pair. Some contacts are thrown out after a day and others after weeks or months. Mark the date you need to replace your contacts on your calendar. If you use a calendar on the computer or your phone, set an automated reminder so that you won’t forget to replace the contacts. When it’s time to replace the contacts, simply throw out the old ones and open a new pack. Make sure you put the correct lens in each eye, if your eyes have different prescriptions. How can I keep my eyes healthy when I wear contacts? Keeping your eyes healthy while you wear contacts takes time and energy. However, proper contact care prevents eye infections and other problems. Keep your lenses clean to reduce the risk of eye infections. Wash your hands before you handle your contacts. Don’t shower or wash your face while you’re wearing contacts. Take them out first to prevent infections. Do NOT wear contact lenses while swimming or if you go into a hot tub. Keep your nails short to keep from scratching or harming your eyes while taking out your contacts. Don’t smoke while you’re wearing contacts. It may cause eye problems. See your doctor every year for an eye exam. Bring your contacts with you. Your eye specialist will check and see if you need a new prescription. Always clean and store lenses with fresh solution. Do not reuse old solution or use another type of liquid. Only use contact solution to store and clean your contacts. Homemade solutions, hydrogen peroxide, saline solution, or other liquids can damage your eyes or contacts. Keep the tip of the solution bottle from touching anything and the bottle tightly closed. Buy trial size bottles of contact solution for travel. Do not put solution into an empty bottle. This may cause infections. Only use wetting drops while you’re wearing contacts. Regular eye drops may damage your contacts or eyes. Your eye specialist will let you know how often you should change your contact lenses, which is based on the manufacturer’s instructions. Some lenses can be used for weeks and others for months, depending on the brand. Throw out torn or damaged lenses. They will not work properly and will hurt your eyes. Only wear your contacts during the day and take them out at night, even if you have extended wear contacts (unless your eye doctor tells you to use them overnight). Don’t store contacts for a long period of time. Without daily cleaning, bacteria can grow–even in the case–making you prone to eye infections. Ask your eye specialist how often you should replace your lenses and how to store them if you don’t wear them on a daily basis. Rinse out your contact lens case with contact solution and let it dry while you’re wearing your contacts. This keeps the case clean. Replace your contact lens case every 3 months to keep the lenses clean and prevent infections. It’s important to see your PCP right away if you have any problems with your contacts. Decorative lenses, also called “circle lenses” or “big eye lenses,” are worn for fashion or as part of a costume. Decorative lenses are not prescription lenses. They don’t correct vision problems and aren’t prescribed by an eye specialist. Decorative lenses change the color or shape of your eyes. They are usually much larger than prescription contact lenses. They also have not been tested for safety. They are sold in costume shops or over the Internet. The manufacturer may say that the lenses are “one size fits all” or that you don’t need to see an eye specialist to wear these lenses. The truth is that decorative lenses are potentially very dangerous. Because they are larger than contact lenses, they prevent oxygen from reaching the eyes. They are not disinfected and can cause serious infection or even blindness. There’s no safe way to wear decorative lenses. Don’t wear them at all and let your friends know about their dangers too.